April 27, 2019 10:00 a.m. to 3:00 p.m. Regular business hours as posted, year around. 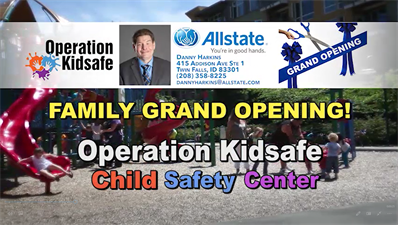 We are excited to announce the Grand Opening of Operation Kid Safe International, Safety Center. We help families with safety tips and create, free of charge, a Bio-Document for each child. No personal information is collected or stored. The bio document contains the child's photo and fingerprints in a "ready to upload" format that is easily used by the Amber Alert system and Law Enforcement. The documents DO NOT contain children's personal information. We send them home with the parent for safe keeping, and for their use in the event they are needed. The Safety Center wil be open year around, at no cost. This service is also available, if needed, for adults that may be facing cognitive challenges.